Purine is a heterocyclic aromatic organic compound that consists of a pyrimidine ring fused to an imidazole ring. It is water-soluble. Purine also gives its name to the wider class of molecules, purines, which include substituted purines and their tautomers. They are the most widely occurring nitrogen-containing heterocycles in nature. Purines are found in high concentration in meat and meat products, especially internal organs such as liver and kidney. In general, plant-based diets are low in purines. Examples of high-purine sources include: sweetbreads, anchovies, sardines, liver, beef kidneys, brains, meat extracts (e.g., Oxo, Bovril), herring, mackerel, scallops, game meats, beer (from the yeast) and gravy. A moderate amount of purine is also contained in red meat, beef, pork, poultry, fish and seafood, asparagus, cauliflower, spinach, mushrooms, green peas, lentils, dried peas, beans, oatmeal, wheat bran, wheat germ, and haws. Purines and pyrimidines make up the two groups of nitrogenous bases, including the two groups of nucleotide bases. Two of the four deoxyribonucleotides (deoxyadenosine and deoxyguanosine) and two of the four ribonucleotides (adenosine, or AMP, and guanosine, or GMP), the respective building blocks of DNA and RNA, are purines. In order to form DNA and RNA, both purines and pyrimidines are needed by the cell in approximately equal quantities. Both purine and pyrimidine are self-inhibiting and activating. When purines are formed, they inhibit the enzymes required for more purine formation. This self-inhibition occurs as they also activate the enzymes needed for pyrimidine formation. Pyrimidine simultaneously self-inhibits and activates purine in similar manner. Because of this, there is nearly an equal amount of both substances in the cell at all times. Purine is both a very weak acid (pKa 2.39) and an even weaker base (pKa 8.93). If dissolved in pure water, the pH will be half way between these two pK values. There are many naturally occurring purines. They include the nucleobases adenine (2) and guanine (3). In DNA, these bases form hydrogen bonds with their complementary pyrimidines, thymine and cytosine, respectively. This is called complementary base pairing. In RNA, the complement of adenine is uracil instead of thymine. Other notable purines are hypoxanthine (4), xanthine (5), theobromine (6), caffeine (7), uric acid (8) and isoguanine (9). 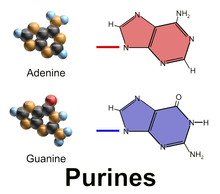 Aside from the crucial roles of purines (adenine and guanine) in DNA and RNA, purines are also significant components in a number of other important biomolecules, such as ATP, GTP, cyclic AMP, NADH, and coenzyme A. Purine (1) itself, has not been found in nature, but it can be produced by organic synthesis. They may also function directly as neurotransmitters, acting upon purinergic receptors. Adenosine activates adenosine receptors. The word purine (pure urine) was coined by the German chemist Emil Fischer in 1884. He synthesized it for the first time in 1898. The starting material for the reaction sequence was uric acid (8), which had been isolated from kidney stones by Carl Wilhelm Scheele in 1776. Uric acid (8) was reacted with PCl5 to give 2,6,8-trichloropurine (10), which was converted with HI and PH4I to give 2,6-diiodopurine (11). The product was reduced to purine (1) using zinc dust. Many organisms have metabolic pathways to synthesize and break down purines. Purines are biologically synthesized as nucleosides (bases attached to ribose). Accumulation of modified purine nucleotides is defective to various cellular processes, especially those involving DNA and RNA. To be viable, organisms possess a number of (deoxy)purine phosphohydrolases, which hydrolyze these purine derivatives removing them from the active NTP and dNTP pools. Deamination of purine bases can result in accumulation of such nucleotides as ITP, dITP, XTP and dXTP. Defects in enzymes that control purine production and breakdown can severely alter a cell’s DNA sequences, which may explain why people who carry certain genetic variants of purine metabolic enzymes have a higher risk for some types of cancer. Higher levels of meat and seafood consumption are associated with an increased risk of gout, whereas a higher level of consumption of dairy products is associated with a decreased risk. Moderate intake of purine-rich vegetables or protein is not associated with an increased risk of gout. In addition to in vivo synthesis of purines in purine metabolism, purine can also be created artificially. Purine (1) is obtained in good yield when formamide is heated in an open vessel at 170 °C for 28 hours. This remarkable reaction and others like it have been discussed in the context of the origin of life. Oro, Orgel and co-workers have shown that four molecules of HCN tetramerize to form diaminomaleodinitrile (12), which can be converted into almost all naturally-occurring purines. [full citation needed] For example, five molecules of HCN condense in an exothermic reaction to make adenine, especially in the presence of ammonia. The Traube purine synthesis (1900) is a classic reaction (named after Wilhelm Traube) between an amine-substituted pyrimidine and formic acid. ^ Rosemeyer, Helmut (March 2004). "The Chemodiversity of Purine as a Constituent of Natural Products". Chemistry & Biodiversity. 1 (3): 361–401. doi:10.1002/cbdv.200490033. ^ "Gout: List of Foods High and Low in Purine Content". Dietaryfiberfood.com. 2016-04-08. Retrieved 2016-07-16. ^ "Gout Diet: What Foods To Avoid". Healthcastle.com. Retrieved 2016-07-16. ^ Guyton, Arthur C. (2006). Textbook of Medical Physiology. Philadelphia, PA: Elsevier. p. 37. ISBN 978-0-7216-0240-0. ^ F. Seela; et al. (2014). Ernst Schaumann (ed.). Houben-Weyl Methods of Organic Chemistry Vol. E 9b/2, 4th Edition Supplement: Hetarenes III (Six-Membered Rings and Larger Hetero-Rings with Maximum Unsaturation) - Part 2b. p. 310. ISBN 9783131815040. ^ McGuigan, Hugh (1921). An Introduction To Chemical Pharmacology. P. Blakiston's Sons & Co. p. 283. Retrieved July 18, 2012. ^ Fischer, Emil (1884). "Ueber die Harnsäure. I." [On uric acid. I.]. Berichte der Deutschen Chemischen Gesellschaft. 17: 328–338. doi:10.1002/cber.18840170196. ^ a b Fischer, Emil (1898). "Ueber das Purin und seine Methylderivate" [On purine and its methyl derivatives]. Berichte der Deutschen Chemischen Gesellschaft. 31: 2550–2574. doi:10.1002/cber.18980310304. ^ Scheele, C. W. (1776). "Examen chemicum calculi urinari" [A chemical examination of kidney stones]. Opuscula. 2: 73. ^ Davies, O.; Mendes, P.; Smallbone, K.; Malys, N. (2012). "Characterisation of multiple substrate-specific (d)ITP/(d)XTPase and modelling of deaminated purine nucleotide metabolism". BMB Reports. 45 (4): 259–264. doi:10.5483/BMBRep.2012.45.4.259. PMID 22531138. ^ "Purine-Rich Foods, Dairy and Protein Intake, and the Risk of Gout in Men". New England Journal of Medicine. 350: 1093–1103. doi:10.1056/NEJMoa035700. Retrieved 2016-07-17. ^ "Bone Health". USDA. Retrieved 2016-07-17. ^ Yamada, H.; Okamoto, T. (1972). "A One-step Synthesis of Purine Ring from Formamide". Chemical & Pharmaceutical Bulletin. 20 (3): 623. doi:10.1248/cpb.20.623. Archived from the original on 2016-05-16. ^ Saladino, Raffaele; Crestini, Claudia; Ciciriello, Fabiana; Costanzo, Giovanna; Mauro, Ernesto; et al. (2006). "About a Formamide-Based Origin of Informational Polymers: Syntheses of Nucleobases and Favourable Thermodynamic Niches for Early Polymers". Origins of Life and Evolution of Biospheres. 36 (5–6): 523–531. Bibcode:2006OLEB...36..523S. doi:10.1007/s11084-006-9053-2. PMID 17136429. ^ Sanchez, R. A.; Ferris, J. P.; Orgel, L. E. (1967). "Studies in prebiotic synthesis. II. Synthesis of purine precursors and amino acids from aqueous hydrogen cyanide". Journal of Molecular Biology. 30 (2): 223–253. doi:10.1016/S0022-2836(67)80037-8. PMID 4297187. ^ Ferris, James P.; Orgel, L. E. (March 1966). "An Unusual Photochemical Rearrangement in the Synthesis of Adenine from Hydrogen Cyanide". Journal of the American Chemical Society. 88 (5): 1074. doi:10.1021/ja00957a050. ^ Ferris, J. P.; Kuder, J. E.; Catalano, O. W. (1969). "Photochemical Reactions and the Chemical Evolution of Purines and Nicotinamide Derivatives". Science. 166 (3906): 765–766. Bibcode:1969Sci...166..765F. doi:10.1126/science.166.3906.765. PMID 4241847. ^ Oro, J.; Kamat, J. S. (1961). "Amino-acid Synthesis from Hydrogen Cyanide under Possible Primitive Earth Conditions". Nature. 190 (4774): 442–443. Bibcode:1961Natur.190..442O. doi:10.1038/190442a0. PMID 13731262. ^ Hassner, Alfred; Stumer, C. (2002). Organic Syntheses Based on Name Reactions (2nd ed.). Elsevier. ISBN 0-08-043259-X.